Tax Day —April 18 this year — is a stressful time for a lot of people. But student volunteers from the Lundquist College of Business’s Beta Alpha Psi accounting fraternity are trying to take the edge off by offering free preparation of simple federal and state tax returns. The service, offered in conjunction with the Internal Revenue Service, is part of the Volunteer Income Tax Assistance program. 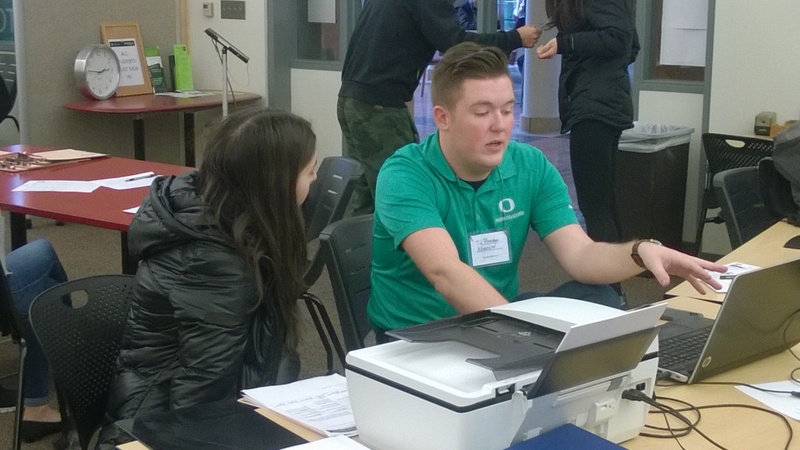 Tax assistance will be available from noon-4 p.m. Feb. 11, 17 and 25; March 4 and 11; and April 8 and 15 in Room 155, Braddock Tutoring in the Lillis Business Complex. Make sure to bring a photo ID, a Social Security card and all tax documents. For a complete list, see the IRS website. To help as many people as possible, accountants are only able to complete and file simple tax returns, and clients are helped on a first-come, first-served basis. More complex returns that include capital gains or losses, out-of-state income or anything else that might complicate things are not eligible for the program. For specifics, and to see if a return qualifies, look at this form on the IRS website. For those interested in becoming a volunteer, it’s not too late. Inquiries about volunteering, and anything else, should be made to Austin Snider at uobap.externalaffairs@gmail.com. Beta Alpha Psi is a national network of accountants, although membership is not limited to accounting majors. The organization also has a weekly lecture series, which meets each Thursday at 6 p.m. in Room 211, Lillis Business Complex. Orpin said the lectures can be helpful to anyone, not just accountants.